On April 13, 2013 Fagbemijo Amosun Fakayode was installed as the Otun Amufawuni of Ibadan Land. The title of “Amufawuni” means “He who makes people love/like Ifa”. As the Otun Amufawuni, or Ambassador of Ifa, Oloye Fagbemijo stands as an example of someone who has been chosen to serve in the capacity of bringing honor and reverence to the tradition with a unique perspective. 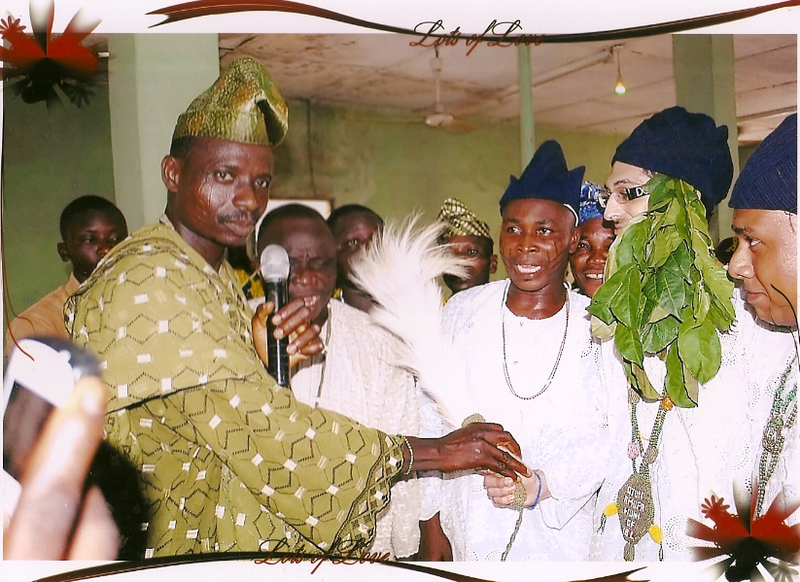 While many Yorubas are distancing themselves from their traditional heritage, Adewale Oshodi tells the story of Adam Gabriel Peretz (Fagbemijo Amosun Fakayode), an American, who has embraced the Yoruba traditional institution by getting initiated into the Ifa religion as a High Priest and Osun advocate. ADAM Peretz is just like a normal American youth. However, at 28, he has chosen a completely different route to follow in life. Today, the Jewish-American, who has been renamed Fagbemijo Amosun Fakayode, is an Ifa High Priest, as well as an Osun advocate. Adam did not have an inkling he would find himself where he is now. Shortly after graduating from the Humboldt State University, Arcata, California in 2008, he had gone to consult an Osun priestess, Iya Osundara in Oakland, California, in finding a true relationship. The Osun priestess prepared a spiritual bath for him, which he used as instructed, and the following day, he met Tina Llopis (who he is married to now). This experience endeared him to the Osun goddess, and he started studying about the Yoruba religious institution. In the course of his search for more knowledge, he found a book online, Osun: The Manly Woman, written by Fayemi Fatunde Fakayode. Adam bought a copy of the book, which explained a lot of things to him about the Osun goddess. He later got in touch with the author, and they began communicating. 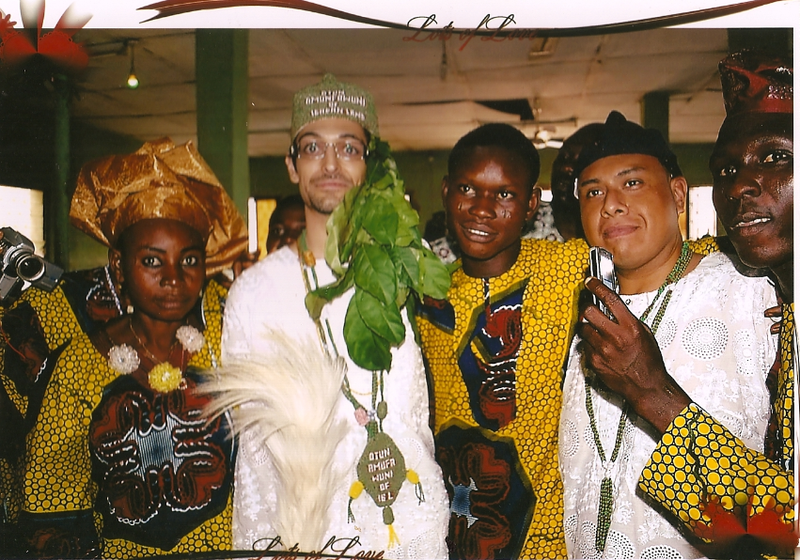 By January 2011, Adam was in Nigeria, and he had Ifa divination cast for him. The result of the divination was that he would become a prominent Ifa priest. With that, he was initiated into Ifa. He was, thereafter, renamed Fagbemijo Amosun Fakayode. Fagbemijo returned to the United States after his initiation, and three months later, precisely April 2011, he founded the Oyeku Ofun Temple in Santa Rosa, California, while also continuing his intensive study under the guidance of Chief Fayemi Fatunde Fakayode. Fagbemijo was in Ibadan again in January 2012 for more intensive study on Ifa. He returned to Nigeria again in April 2012, when he was initiated into the Orisa Osun, and was subsequently given the name Osunyemi. Today, Fagbemijo is happily married to Tina Llopis, who has also been renamed Oyaseye Fakayode, and they have a young son, Famarada Fakayode. Last week, the American Ifa priest was in Ibadan to be decorated with a chieftaincy title, the Otun Amufawuni of Ibadanland. He came in company of one of his apprentices, Ernesto Villalobos, who has also been initiated into Ifa. While speaking during his chieftaincy celebration, which was held at Oja Oba, in Ibadan, Fagbemijo said he is now living his life in the right direction. “I am lucky to have come across the Ifa religion, and it has made a difference in my life. 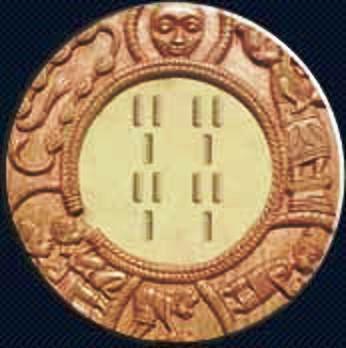 I have even done the Isentaye (a peep into the future) of my son, Famarada, and I have seen he will also become a great Ifa priest”, Fagbemijo said, while admitting that it is only through Ifa that one could actually know the future of a child. “Unfortunately, most Yoruba people see those who practise the Ifa religion as evil people. I could remember when I was coming to Nigeria, and I was seated next to a Nigerian on the plane. He asked me why I was coming to Nigeria, and I told him I am an Ifa priest, but the way he looked at me was disgusting. He asked why would I become an Ifa priest. “The way Nigerian filmmakers portray Ifa priests is responsible for this stereotype and it is high time something was done to correct this negative impression”, Fagbemijo said. 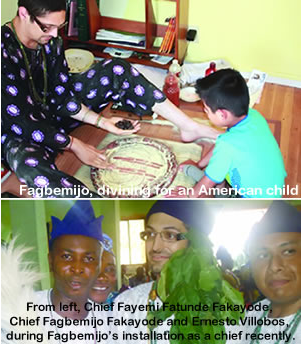 Fagbemijo now practises as a Babalawo in his Oyeku Ofun Temple in California, “and I consult for different people, like ethnic Chinese, Japanese, Filipinos, White Americans, and even Nigerians. “I also have many apprentices; people who are learning to become Ifa priests. 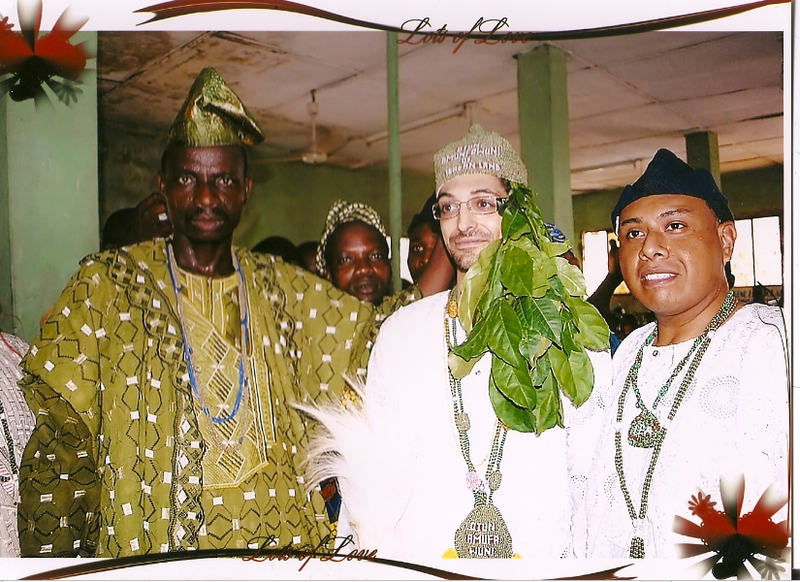 In fact, I came to Nigeria with Ernesto to be initiated into the Ifa religion. “I studied sciences in the university, but now, I am worshipping the earth. I thank Ifa for this”, Fagbemijo said. In his contribution, Ernesto Villlobos, who was also in Nigeria to be initiated into the Ifa religion, said he decided to become a faithful because of what he had experienced. “For a long time, I was without a job, and I consulted Fagbemijo, who did some things for me. Immediately, I got employed. I am now a top manager where I am working now. It was because of this that I decided to become a faithful”, Ernesto said. While calling on Yorubas not to neglect their religious and cultural heritage because of modernity, Chief Fayemi Fatunde Fakayode lamented the fact that foreigners are now appreciating our traditional religion better than us. “Apart from Fagbemijo, there are many other non-Yoruba Ifa priests all over the world today who are promoting the Yoruba heritage, while we Yorubas see our way of life as evil. Speaking on how Fagbemijo is coping with the recitation of the Odu Ifas (Ifa verses), Chief Fakayode said, “although he is still having challenges with the Yoruba language, but he is a fast learner, and in no time, he would be fluent in the language,” Chief Fakayode said. This a a very inspirational story.